Count on us when you need roofers for your Midland home or business who never cut corners. There are generally a few times you’ll need roofers for your Midland, Ontario home. Not only might you need them when you build a home, but also when you are dealing with storm damage repair and eventually when you need to replace your roof. While other roofers in the area consider each customer a one-time acquaintance, here at Slippery Slope Roofing, we understand that building a relationship where you feel comfortable calling us again in the future and also referring us is an important part of growing our business. On top of that, we really care about our customers, and cutting corners simply wouldn’t be right. Between our owner and foreman, we have 50 years of combined experience, so there isn’t much we haven’t seen and done when it comes to providing roofers to handle any situation. Over the years, we’ve treated each and every customer like we would want to be treated. What that means to you is that we get everything done right and in a timely manner. We do what the manufacturer requires for their warranties, we keep our prices competitive, and we do one job at a time so it can be done promptly. 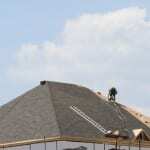 We are shingle roofers for both residential and commercial properties, providing installation, replacement and repairs. Whether you have a few loose shingles from a storm, you have noticed a damaged section from a tree branch, or you need a full roof replacement, you can count on us to get the job done to your complete satisfaction. Contact us today with any questions you may have or to schedule an appointment for a roof assessment and quote. At Slippery Slope Roofing, our roofers proudly serve Midland, Barrie, Orillia, Bradford, Alliston, Newmarket, Midhurst, Cookstown, Beeton, Innisfil, Angus, Collingwood, Wasaga Beach, Oro-Medonte, Midland, New Tecumseth, Clearview, Bradford, Essa, Stayner, Springwater, and surrounding areas of Ontario.